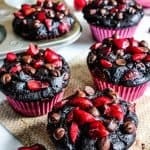 Recall times when you only desire to eat a moist, soft and sweet muffin without adding even a slightest bit of all purpose flour, white sugar or extra fat? And still be able to taste your muffin in its most buttery, softest and lightest form? I got you covered today. Finally, we have an indulgent banana muffin recipe that is secretly healthy! WHAT hides in your easy BANANA bread MUFFIN??? Begin by mashing a dull, pale and extremely ripe looking banana. You only need a banana with as many brown spots as on a giraffe! Furthermore a banana that has no yellow color left in it will be the best. Believe me. The ripen the banana, the merrier will be your muffin)! Banana is single-handedly, the star of this muffin show today. Our creamy banana does a lot to muffins besides adding a fruity scent to them. It also moistens, softens and lightens the baked goods. Helps in rising them above and beyond our expectations. Even when we are adding 100% whole wheat flour to the batter. So much is going on inside a small innocent muffin…phewww!!! Moving on, mix all the wet gang of ingredients (mashed banana, egg, honey, oil and extracts) together. Add this to the dry mix of wheat flour, salt and baking soda. And your batter is ready. Dust your nuts with some flour. As a result, they don’t sink in the bottom as muffins bake. Mix nuts in muffin batter. And bake!!! I know you are salivating. Don’t wait any further. Lets jump right into the process of making them. These are so easy to whip up. You don’t even need a mixer. All you need is two bowls. One for your dry ingredients and the other for wet ones. Sprinkle the remaining toppings and bake! My bananas were not as ripe as I needed them. And undoubtedly, I did not wanna wait for another minute to bake these lovely muffins. So what did I do? I quickly poked them with a fork and baked them for 15 minutes at 350 deg F. in a preheated oven. Mashed these after they cool down slightly. For an ultimate texture contrast, slight crunch and added beauty, we are topping our muffins with a mix of oats, walnuts and raisins. The topping adds a little extra to these muffins. It is totally optional. But a must for my texture loving folks out there. You can very much replace nuts with chocolate chips. As a result you got chocolate for breakfast! Look at these baked banana beauties!! 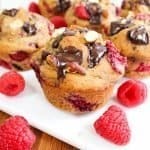 Not only these banana muffins are flavor rich, but also are extremely moist, fragrant and everything that a banana bread is. I topped them with some nuts and a sprinkle of fiber (oats). Certainly, when chewy-crunch from walnuts and mild sweetness from raisins when gets mixed with banana and a hint of vanilla, you reach muffin oblivion! Once again, there is no processed sugar involved in today’s Banana muffins recipe. I can’t stress it enough. Because they get all their sweetness from honey, natural sugars from banana and a hint of brown sugar. However, all these ingredients also render the moistest muffin your palate would ever experience! These muffins are even better the next day (if you manage to spare any). Vegetable/Canola oil can also be substituted for coconut oil here. And for that buttery taste I have added butter extract to my muffins. If unavailable at your end, you may substitute half butter(melted)+half oil of the total oil used. So much goodness from whole wheat, banana, honey, walnuts, oats and raisins would open-heartedly accept little butter. Right? Right?? Take a moment to soak it all in. Because you are about to bake some mighty muffins which are so filling that only one is all you need to combat the world! Buttery, filling, moist, light and easy banana bread muffins with no processed sugars. Topped with crunchy nuts and oats. Muffin treat just got way more delightful than it ever was! Preheat your oven at 350 deg. F (177 C). Line a 12 count muffin tin or lightly grease it. Set aside. Also, coat 3/4 of your nuts in some flour. Save the rest for topping. To make the topping, mix in oats and 1/4 of the walnuts+raisin mix. 2. Sift wheat flour, baking soda and salt together. In another bowl mix mashed banana, honey, brown sugar, eggs(slightly beaten), coconut oil(or/and melted butter,if using it), vanilla extract and butter extract, Mix it all well. 3. Pour wet ingredients over the dry ones and fold lightly. Add hot water and mix well. Take extra care while folding the batter, don't over mix. This can result into hard and rubbery muffins. Fold in the nuts. 4. Divide the batter equally in 12 liners and sprinkle the oats and nuts topping over the batter. Press them in lightly. 5. Bake these muffins for 23 minutes. They will be set in the center and will be golden brown in color. Also a toothpick inserted in the middle will come out clean. 6. After 5-10 minutes, transfer them on a wire rack to cool down completely. Under any circumstances, do not over-mix the batter. Mix in only till no lumps of flour appear in the mixture. Please take a minute to measure your eggs with tablespoon too. Their sizes may vary, and adding more or less won't result into a perfect bake. 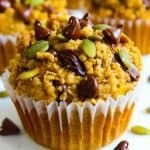 To make these muffins vegan- use vegan brown sugar instead of honey, use a vegan egg replacer ( I use Bob's Red Mill) and a vegan flour! You may store them at room temperature in an air tight container for upto 3 days. In fridge for upto 7 days. These are also freezer friendly and store well for upto 2 months. Looks so yummy! Great recipe! Thanks for taking time to read my post and liking it. 🙂 They taste out of the world. I hope you get to try these sometime. Try substituting nuts with chocolate chips, Yumm!!! Ha ha ha. Oh, he’ll love that! Will definitely try this out, bookmarking! any egg substitute? I generally use yogurt. Haven’t tried it without eggs yet Cherry. Yogurt might not work here. It doesn’t bind baked goods. And this muffin already has a lot of moisture. You may try egg replacer. I’d love to know how it turned out if you do. Hi, do I need to add the same amount of butter as the butter extract coz I don’t have it now. Thank you. Glad to hear this Nithya!